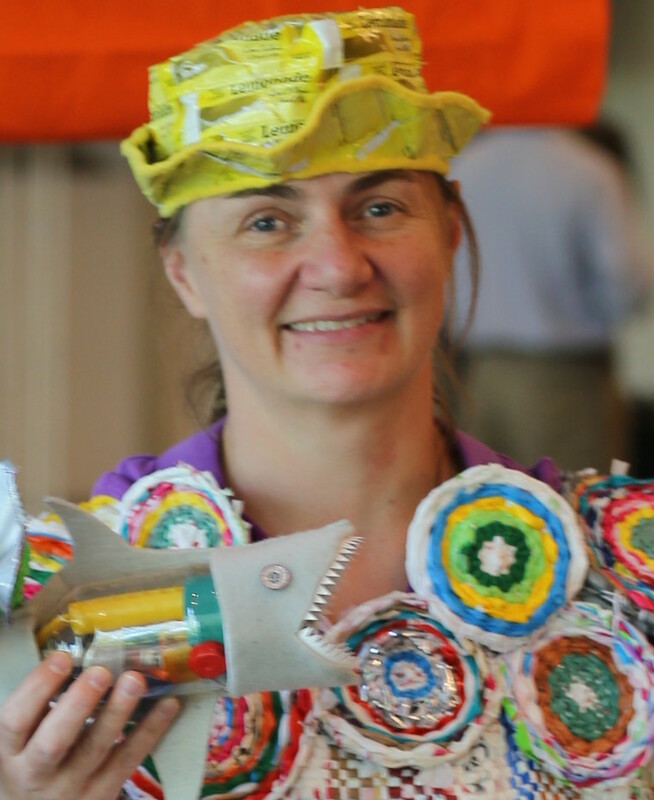 I am excitedly weaving a dress from plastic bags for a Trashion Fashion show on May 21st. It is going to take a lot of woven circles, so I needed to find a way to make my weaving project mobile so I can weave wherever I can. 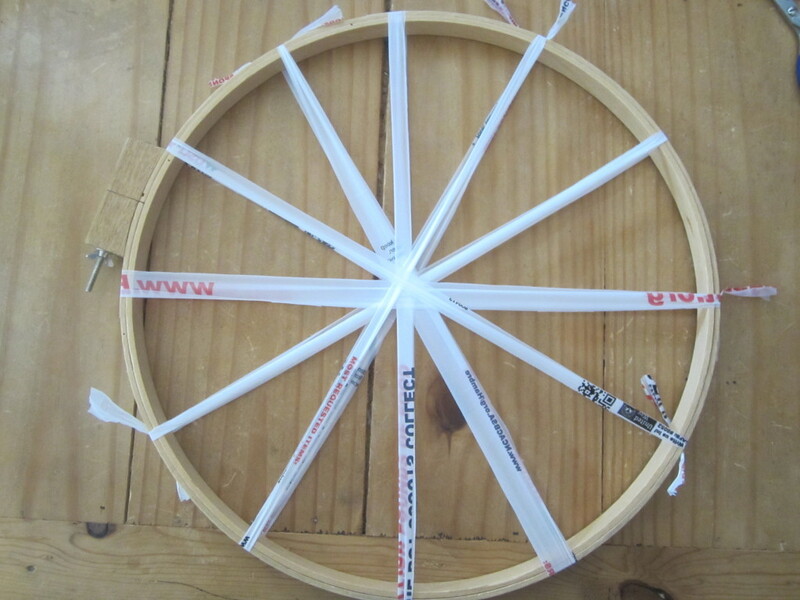 To do this, I figured out how to weave a circle on a large embroidery hoop. I used my largest hoop, which is 16 inches across. You could use a smaller one but you would just make smaller circles. 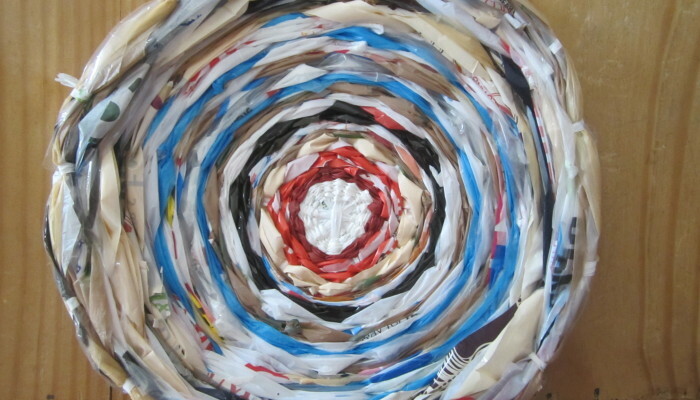 First, I cut loops of plastic from bags. The fastest way to do this is to fold the bag length-wise a few times until you have a long rectangle about as wide as your scissors. Then cut straight across and get loops. For typical grocery store sized bags, the loops are just the right diameter to fit across my largest embroidery hoop. 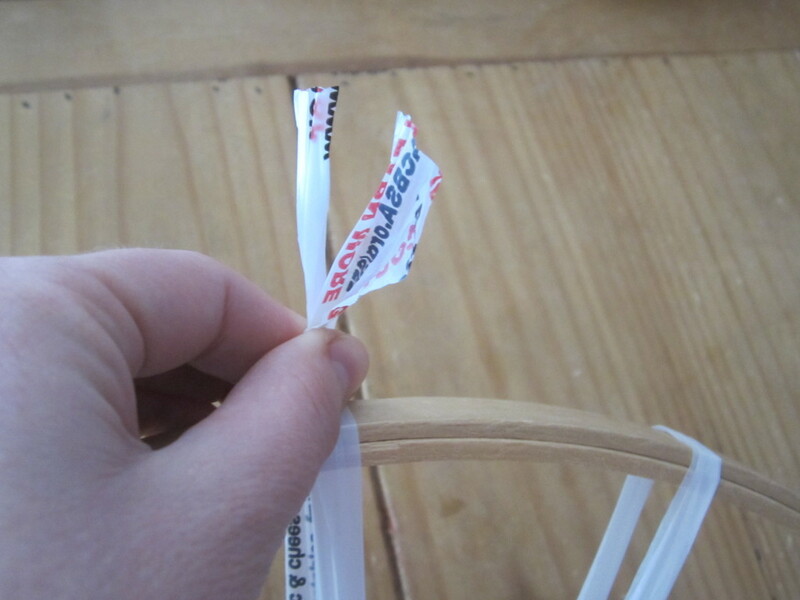 To put the loops on the hoop, stretch the loop across and cut it so you have two pieces to tie. 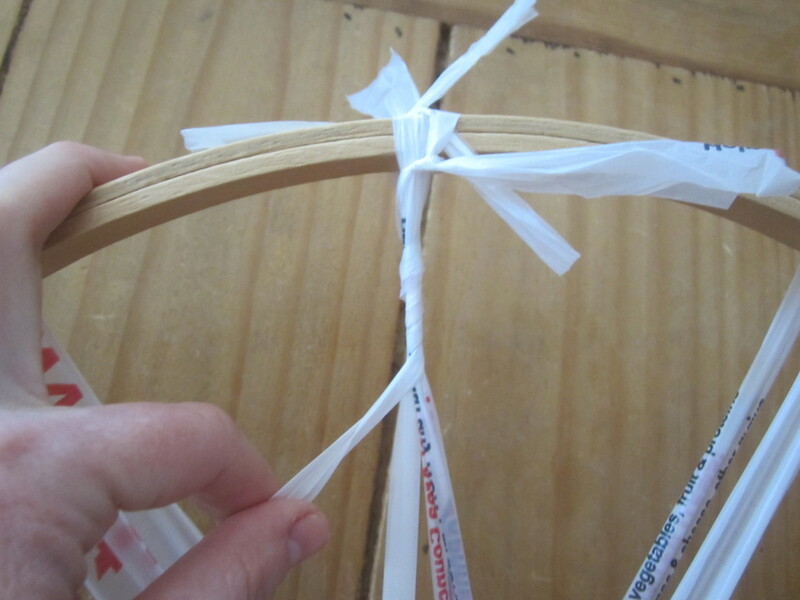 Tie a knot as close to the hoop as possible. Even with a tight knot, sometimes the loops slip. If you find this is the case, you can tape them down in the optimum location. 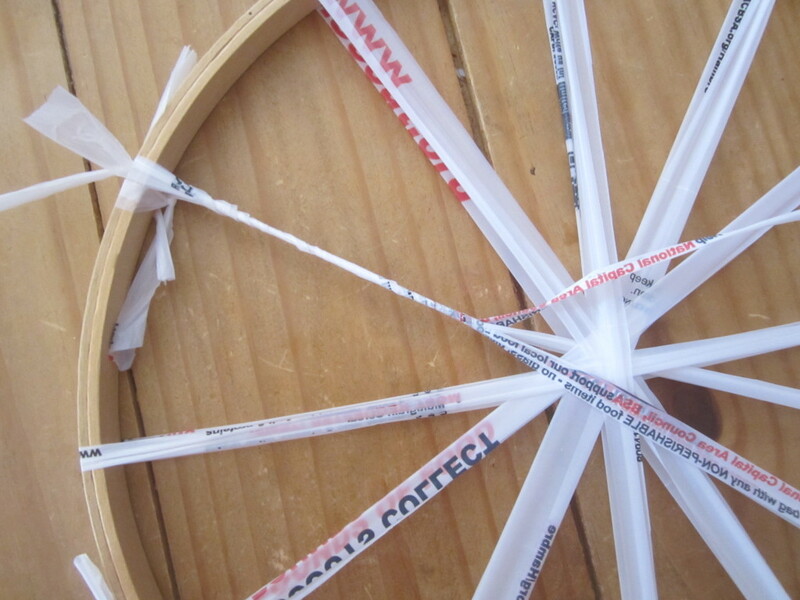 To weave on a circle, you need an uneven number of spokes. So add one more loop to your circle. There should be a total of seven. Pull one half of that last loop in alignment with an existing loop, so two become one. Take a new loop and cut it. Tie it to the hoop right by that spot. 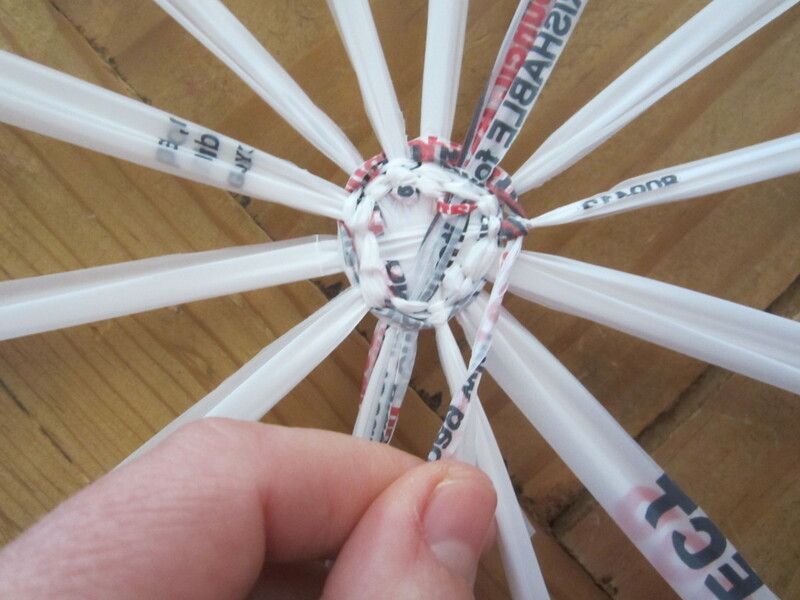 Wrap it around the grouped spokes. When you get to the center, you can start weaving with the rest of that loop. 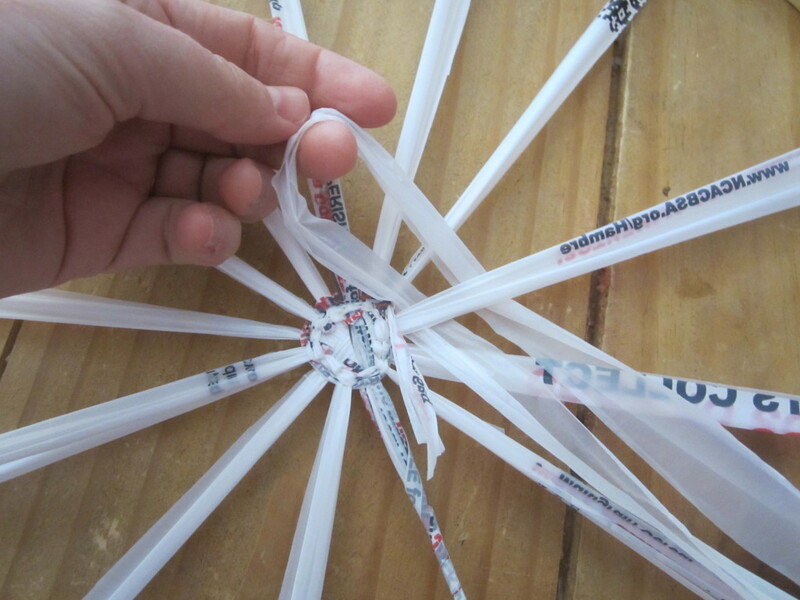 Pull the weaving as close to the center as possible. Once you finish circling that first loop, tie if off on the closest spoke with two half hitches. The knots will disappear into the weaving. Get a new loop and hook it on to the same spoke. Start weaving with it. I found the best way to hold the hoop while you are weaving with a hoop is to sit in a chair and put the hoop against your stomach. Then squeeze it against a table. 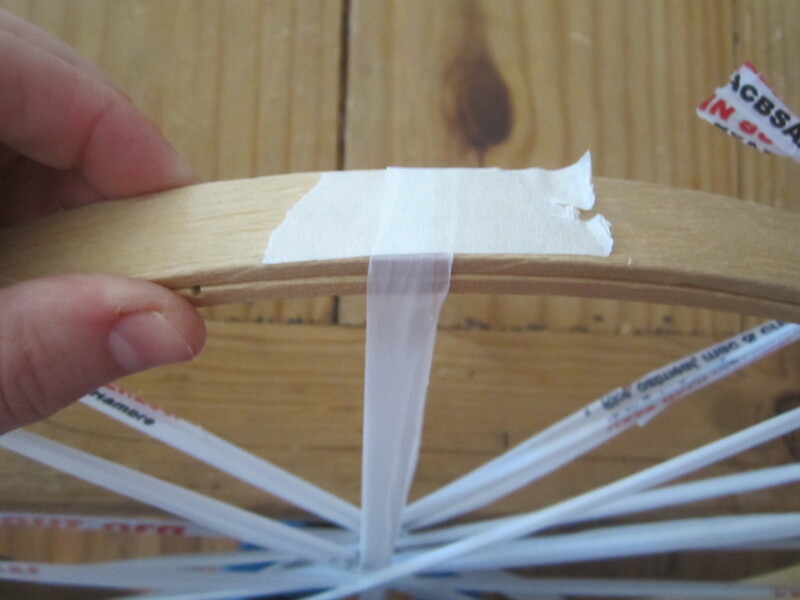 This leaves lots of space below the hoop for the weaving action to happen, and keeps both hands free. Here’s a video showing the rhythm of adding a loop and weaving with both hands. 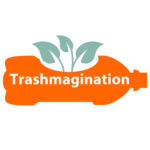 If you turn the sound on, you’ll see how much it sounds like you are eating a giant bag of potato chips!